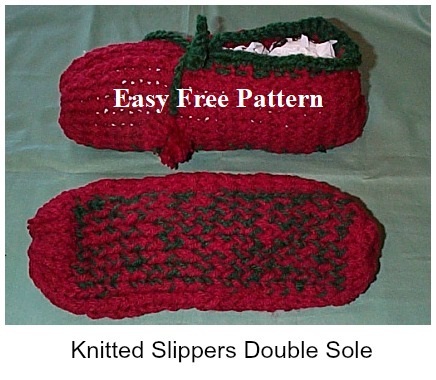 Free and easy slipper knitting patterns for double thick soles knitted on a loom. Patterns can be found just about any place online. But I don’t think you will find any like these. These slippers have great thick double soles for comfort, warmth and longer ware. They are also easily made up on a round loom. These slippers were made up on a Knifty Knitter blue round loom. You can fine them easily at any Wal Mart or Craft store. I am including a diagram to show you how and where you will add the extra yarn. I used regular 4 ply worsted weight yarn. This pattern is for a man, size 9 –10. It can be made larger or smaller by adding or subtracting rows. No need to worry about the amount of pegs used. It will be the same for all adult slippers. These slippers were no sooner off the loom and on my husbands feet. I enjoy making them and he enjoys having toasty toes in the cold winter. This would also be a great charity item for the cold areas of our nation. The elderly don’t have good circulation in their legs and they get colder quicker then the young. 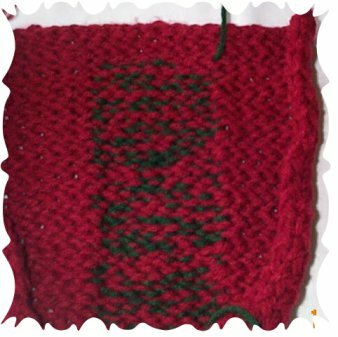 There are no fancy knitting stitches in this pattern so a newbie can make it up easily. You just use the knit stitch through out. You will be knitting these slippers from the heel to the toe and in one piece. 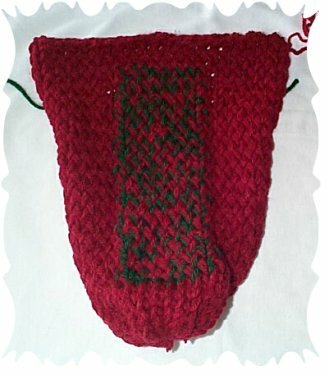 Here is the hand knitted version of this pattern. Double Sole Hand Knit Slippers. I enjoy all kinds of slipper knitting patterns. I hope you do also. Blue Knifty Knitter Round Loom with 24 peg. Any worsted yarn. You will use 2 strands all the way through and three strands for the center stitches. ** Ewrap 8 (with two strands) Pick up third strand and ewrap 8. (drop third strand) ewrap 8 with 2 strands. (Do not cut yarn. You will just pick it up when needed and drop it when not needed.) Knit all stitches. Ewrap and knit the rest of these rows. 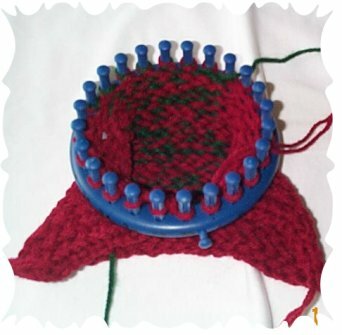 Connecting and knitting in complete rounds. Using a large eyed needle cut yarn leaving a long tail. String through all stitches. Remove from loom and gather toe. Sew up heel and single crochet around edge. Chain 70 and weave in top of slipper for tie.